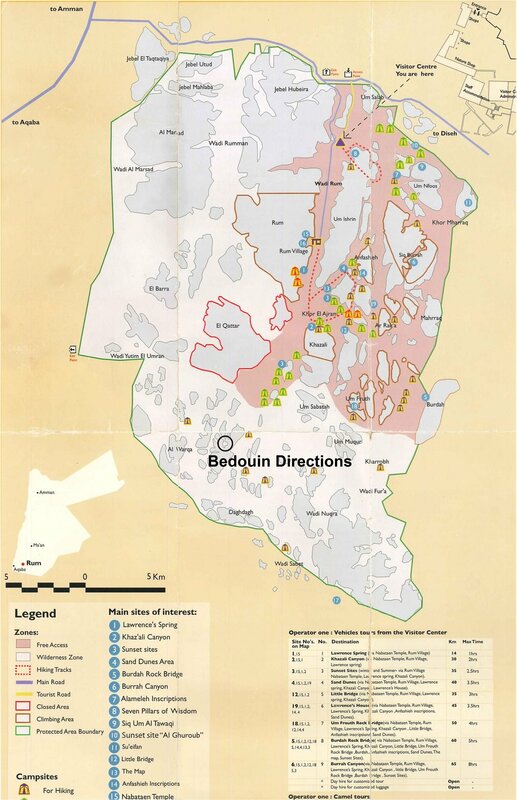 Once you have arrived in Wadi Rum, we will get organised and I will introduce you to your guides for your trip. When you are ready you will leave Rum village on foot, heading into the desert with your guide. Visiting along the way some key sites and then heading out to spend your first night in my Camp. Other nights you will be Bivouac camping in the desert with your walking guide and cooking guide . The cooking guide will set up the camp in advance of your arrival. We provide mattresses and blankets, your dinner will be prepared for you on the fire. The evening spent star gazing. During the day you will stop for lunch in a beautiful spot, your guide usually preparing some Bedouin Tea on the fire. 1. Lawrence Spring Walk up through rocks and boulders to find the water (and a lovely fig tree to rest under). During spring time you are greeted by the heady smell of herbs.. The view across the Wadi from here is legendary! 2. Small Sand Dune The view of the Wadi Rum valley from here is excellent. You can climb up the sand dune for the wonderful view at the top. Then we like to jump off it & run down it (some silly people also like to roll down it!). 3. Khazali Canyon This canyon was once used by the local Bedouin to rest in the shade, especially in the hot summer. You can easily imagine how it would have looked with Bedouin tents, families resting, drinking tea, and children playing. You can find on the canyon walls many ancient rock inscriptions (See if you can spot the inscriptions of feet, and the Orynx). 4. El Qattar Spring This natural spring is set up in the mountain, and you can see what the Bedouin have done to catch the water. There is a Bedouin Graveyard and a lovely view across the valley where you have walked. 5. The Camp: Enjoy some dinner, the stars and the night in the desert. In the Camp we have Bedouin tents, with mattresses and blankets. We have toilets (two Western) and two shower's (cold water/ sun warmed). We have a cosy main tent for sitting and relaxing in, in the evening. The Camp is in the white desert in a unique and beautiful location, secluded and away from any other tourist camps. 1. Small Arch This natural rock bridge is easy to climb, and is fun to do. You visit this place in the morning as it is not far from the camp. 2. Harab Anta Cave This cave was lived in by an important man named Harab Anta. People would come from miles around to see him to get his help in resolving their disputes. We usually have lunch nearby. We then continue through the desert heading towards the border to Saudi Arabia. This area of desert is very quiet and not many tourists visit here. You will finish the days hike in a beautiful place and then spend your second night sleeping bivouac under the stars with your walking guide and cooking guide. We provide mattresses and blankets, your dinner will be prepared for you on the fire. The evening spent star gazing. In the morning after breakfast in your temporary Camp we will continue on foot hiking back towards Rum village down the long Siq Nograh. Siq Nograh This is called a Siq but it is so wide that it is more like a valley. There are beautiful views from here, particularly to the North as it is down hill. The hike will finish for the day at Um Momgour where you will spend your third night bivouac camping in the desert. Um Momgour is a beautiful mountain to the North of Siq Nograh, the hike between the two places offers beautiful views to the red and white desert. 1. Um Frouth Arch For some scrambling (or scrambling watching). This is a natural rock bridge, created by many years of water and wind. You can climb to the top… as long as you are not afraid of heights! 2. Abu Khshabyr Canyon We walk through this beautiful canyon and then continue to your camping spot for the night. 3. Bivouac Camp: Burdah Arch This natural rock bridge is set high up on the mountain. We will camp close to Burdah Arch mountain. This is a beautiful and quiet area of the desert. You will sleep here, snug up against the mountain. 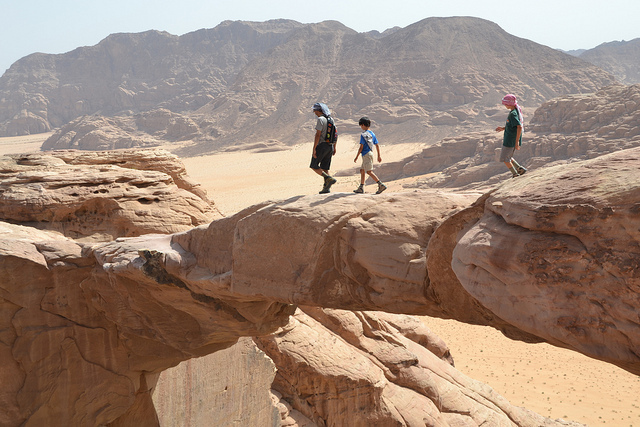 This natural rock bridge is located high up on the mountain and can be reached following the Bedouin road through the mountain. Um Ajil A large sand dune next to Um Ishrin. The view back down the Wadi Rum valley is very beautiful from here and it is a view usually missed by most visitors to Wadi Rum, even though they pass very close by. You will bivouac camp here for your last night in the desert. This morning after breakfast we will return to Rum Village by Jeep for your onward journey. Usually arriving approx 8.30am. You could also include an 'add on' hike through Rakabat Canyon to the village on day 6, if you aren't quite hiked out yet. This fun hike is full of scrambling and follows a interesting & fun route through the mountain. To include this please add 40JD to the quoted price. The hike would finish at approx 11am-12pm in Rum Village. This hike does involve a lot of scrambling so a good head for heights is needed. We will take water, food and bedding to each place for sleeping and set it all up on your behalf. Dinner, Lunch, Breakfast & Bedouin Tea is prepared on the fire by your guide. For multiple days you may have a picnic lunch. You will need to carry a small day pack with your water, camera & any snacks you want etc. Please read the protected area guidelines (provided in the Visitor Center map) in regards to going to the bathroom, litter etc. Prices for groups of 10 persons or more, further discount can be given. Please contact us by using the Enquiries form. 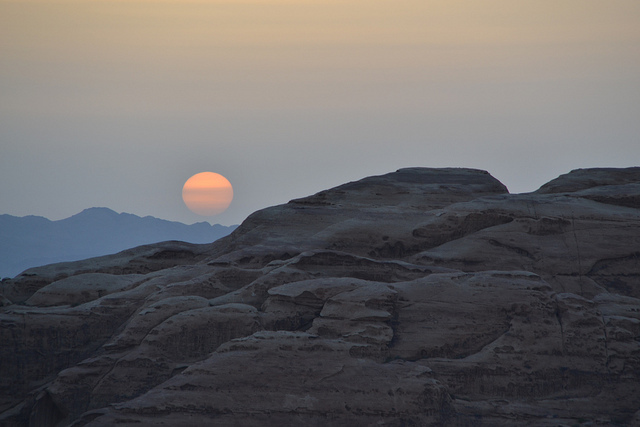 The 5JD entrance fee to Wadi Rum is NOT included. Drinks ARE included. I provide bottled water for the duration of the Wadi Rum trip, as you need it, at lunchtime usually some kind of soft drink or juice, and plenty of Bedouin tea. We can also provide hot water (or tea without sugar) if you prefer to make your own kind or tea or coffee. This tour starts on the first day at 10am from Rum Village. On the last day after breakfast at approx 7.30am we will return to Rum Village by Jeep, for your onward journey. Usually arriving by 8.30am. This Jeep transfer is included in the price.